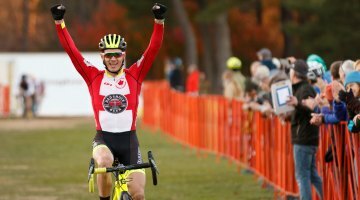 Raphael Gagne, pro MTBer with Rocky Mountain, has been having a banner year in cyclocross, starting with the early season race at Green Mountain where he took his first win on Day 2. 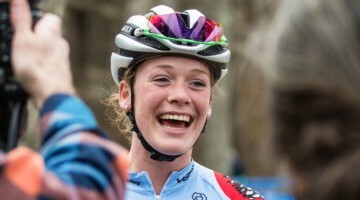 After a brief respite back in Canada and back to school, Gagne returned to New England and had a great ride to fifth on Day 1 at Providence and came back the next day to take the third spot on the podium. 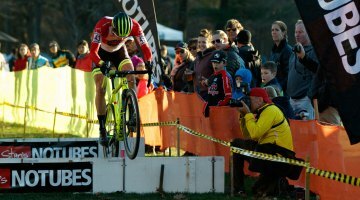 Originally, those early races were meant to be the end of his early season cyclocross, but the great rides motivated him to head to Ellison Park in Rochester, New York, this weekend, where he took back-to-back wins against Zach McDonald, Stephen Hyde, Jeremy Durrin, and plenty more top-tier talents. We grabbed some shots of his bike back at Providence, and while the Rocky Mountain may not be equipped with electronic shifting or disc brakes [see Issue 22 for the latest ’cross-y upgrades], it’s got one heck of an engine powering it. Gagne showed up for Providence weekend with no pit bike, no pit crew (he had to hand his iPhone to a photographer in the crowd for his podium shot), and still managed to pull off a third place on Sunday after a ride to fourth on Saturday. 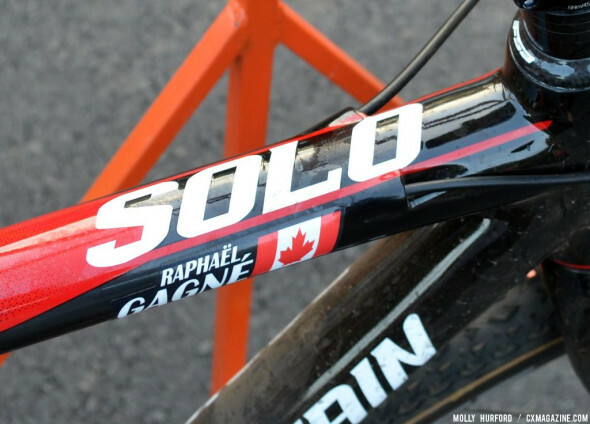 To say that the French Canadian mountain biker had the ride of the weekend would be a fair statement, and to do so unsupported with last year’s components proves that it’s often about the engine and not the machine or team. 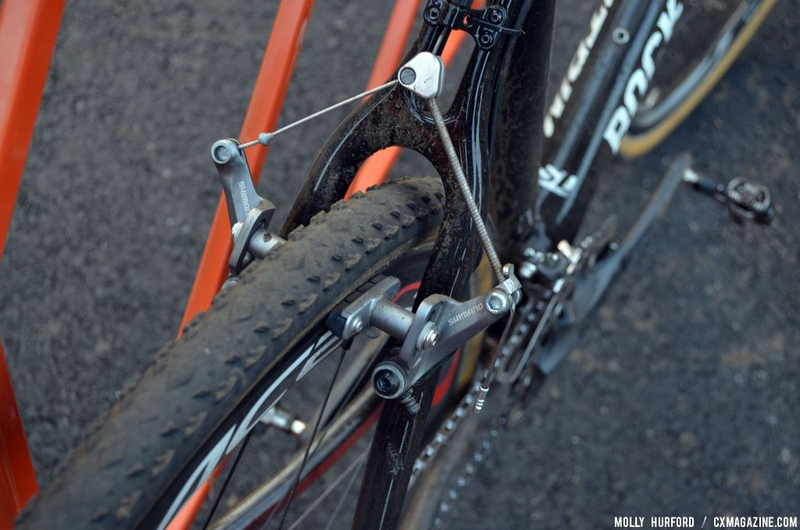 Still, we wanted to take a closer look at the college student’s unique Rocky Mountain Solo cyclocross bike. Gagne’s frame looks remarkably similar to the special edition Rocky Mountain carbon cyclocross frame raced by Geoff Kabush in 2011, with internal top tube cable routing instead of Kabush’s down tube routing, but doesn’t resemble anything close to a production frame offered by Rocky Mountain. 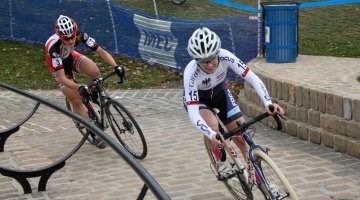 Rocky Mountain offers aluminum cyclocross frames, and in 2012 offered a model with carbon stays. 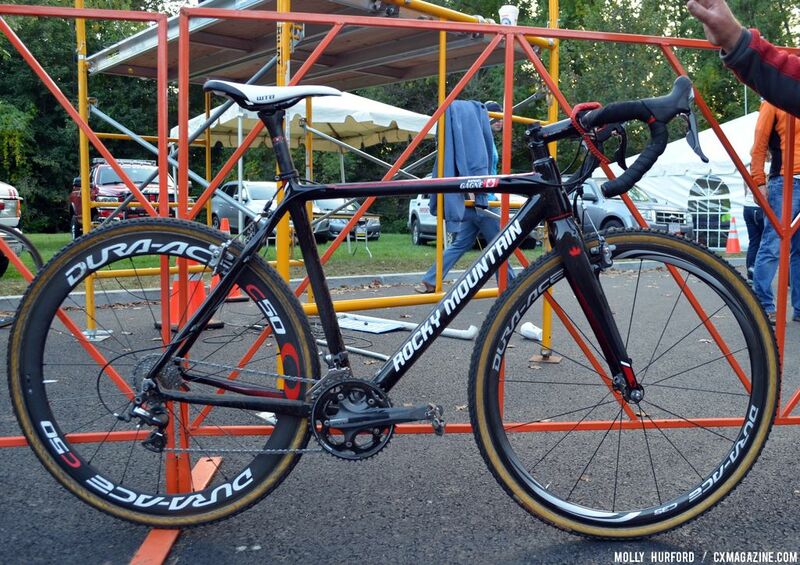 For 2014, the Canada-based company only offers two cyclocross models, both aluminum, and both with disc brakes. Pros racing non-production frames is nothing new, as we saw last year with Compton eschewing Trek’s Cronus cyclocross frame for a custom-made model, although instead of wanting a lighter carbon model over production aluminum, Compton turned down Trek’s carbon Cronus CX offering for an aluminum frame with custom geometry, and her bike would eventually be the basis for the new production 2014 Trek Crockett cyclocross bike. We doubt Gagne’s carbon frame will ever be a production model, and was simply Rocky Mountain’s attempt to offer a lighter, cantilever option to its team members by repainting a readily-available carbon frame. In fact, upon close inspection, the Solo CXR Team Edition frame looks remarkably similar to several frames available from other manufacturers, including the Blue Norcross raced in the past by Jonathan Page and the cantilever model of the Foundry Auger (disc model of the Auger reviewed in Issue 19). It’s no secret that many different brands come out the same factory, and thus it’s not surprising that the split wishbone seat stay seen on Gagne’s bike below is one element shared by all three frames. 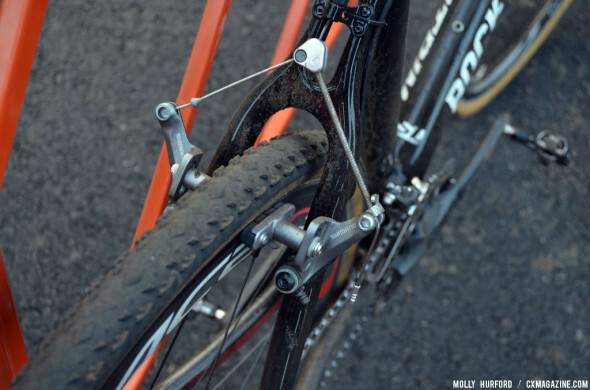 The rear dropouts also look the same as the Blue and Foundry frames, and the internal top tube cable routing looks identical to that of the cantilever Foundry Auger, as raced by Mackenzie Woodring at Barry Roubaix. 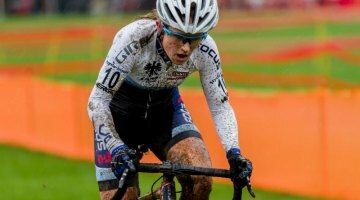 Gagne might have gotten a special frame in the form of a repainted production bike or open mold frame, but raced the UCI weekends with less support than the average Masters racer, without a pit bike, fresh tires, a support team or the latest componentry. Gagne certainly has top-shelf components, but not the latest and greatest. He’s running 2012 Shimano Dura-Ace 7900, with a 10 speed 11-27 rear cassette and 34-46 front chain rings, for a lower-than-average low gear. Shimano C-50 carbon tubular wheels and well-worn Challenge Fango tubulars kept him rolling ahead of the competition. 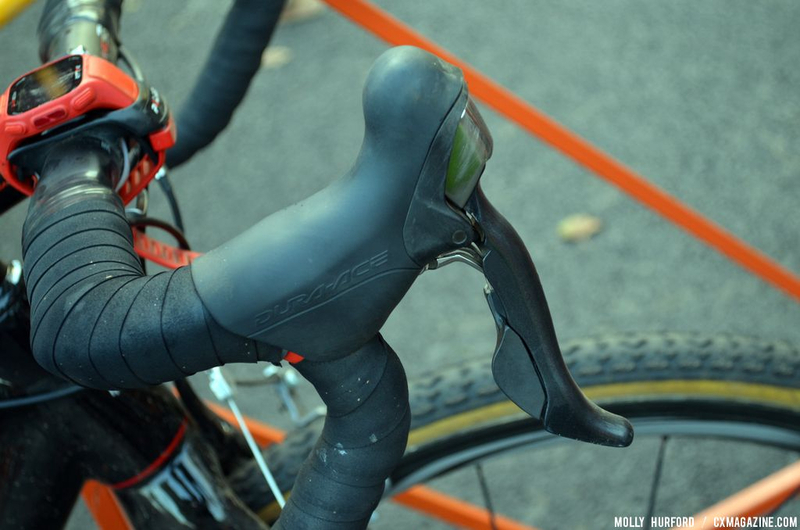 The Shimano CX70 cantilever brakes, the same brakes used by Sven Nys, slowed down Gagne when necessary. We saw his bike in Providence with an Easton EC90 Aero carbon bar that has an iconic red finish that peeked through his handlebar tape, but he made a change before Rochester. 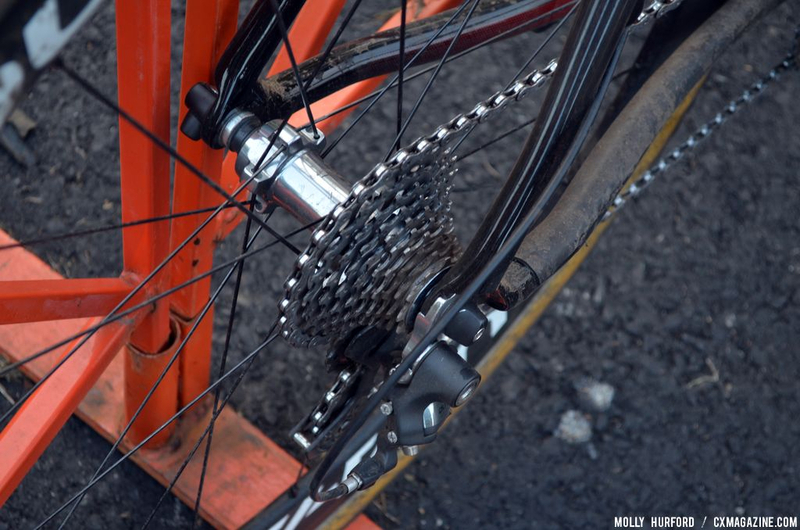 “I switched the handlebar [from a carbon Easton EC90 Aero] to a Shimano Pro Component 44cm wide,” which was a switch from the 42cm bars that he raced with at Providence two weeks earlier. 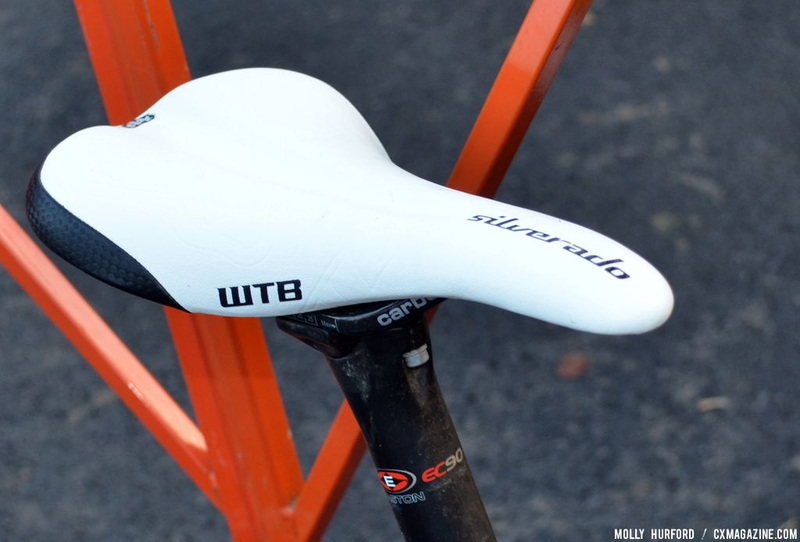 A WTB Carbon Silverado saddle with carbon rails and tubular Shimano C-50 wheels with Challenge Fango tubular tires completed the build. 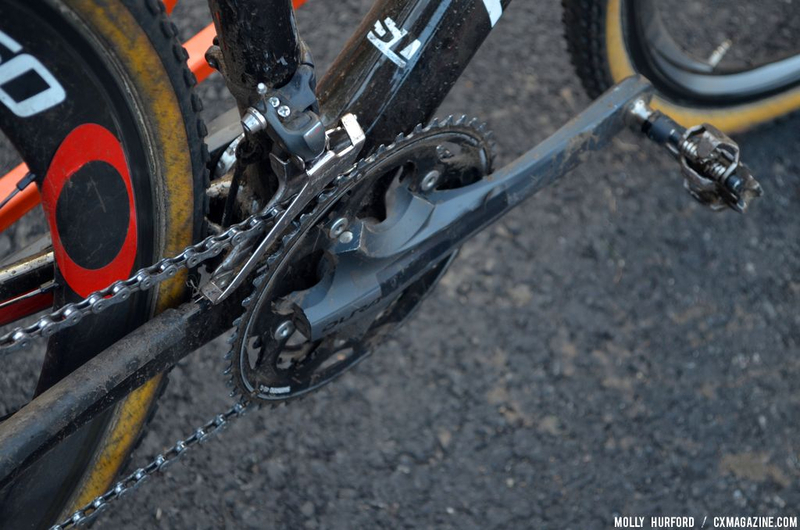 Before Saturday’s race in Rochester, Gagne flatted his front tire on a pre-ride, and spent most of his time pre-race trying to find a wheel to borrow or a way to seal his Fango, since he didn’t have a pit bike or spare wheels. He eventually found Velo NRS, the neutral support for the race, and after half a bottle of Stan’s NoTubes sealant, the tire finally sealed. It’s not often a college student shows up to a UCI cyclocross race and bests all or most the pros, but Raphael Gagne has been doing just that. He’s proving it’s not the guy with the most expensive, newest components or best support who can do the best in races. Molly Hurford and Andrew Yee contributed to this report. Nice that a privateer can stand his own against the well funded teams!! When are you getting on it Ross?